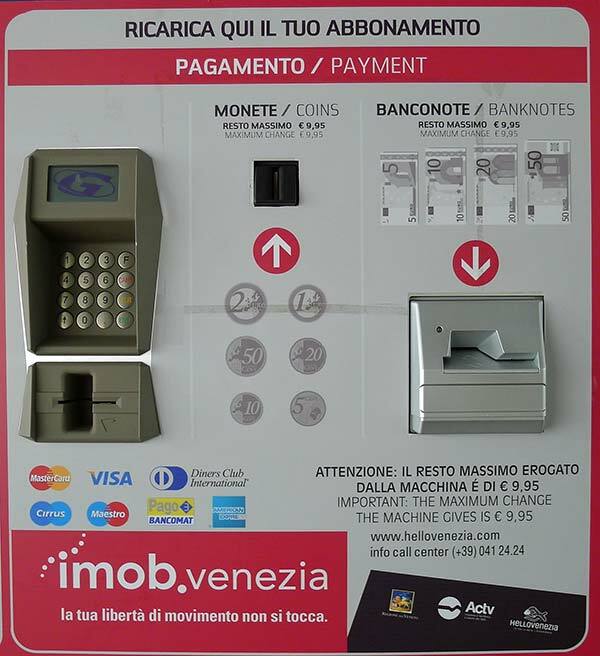 ACTV, Venice's public-transportation authority, has installed multilingual ticket-vending machines at many waterbus stops. Some of the machines are replacing manned ticket booths, while others are being used to supplement human ticket vendors. They provide an alternative to standing in line at a crowded ticket window. They operate 24 hours a day. 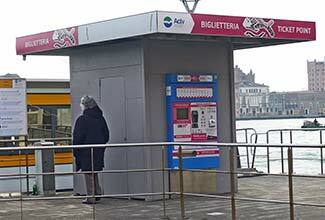 ABOVE: A ticket-vending machine has replaced the manned biglietteria at Venice's Zattere vaporetto stop. On this page, we offer step-by-step instructions on how to use the new machines. To get started, go to Step 1 below. Note: Some ACTV machines are programmed differently from others, so you may find slight variations in screen options. 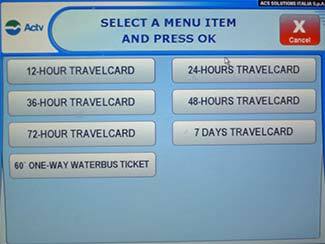 Tourist travel cards for unlimited rides over a period of 12 hours to 7 days, depending on which version you choose. 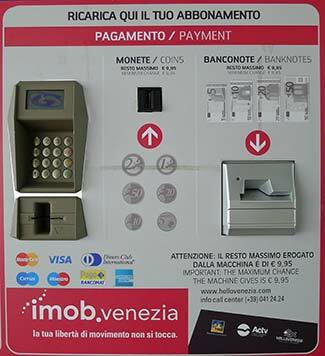 (See our Venice Tourist Travel Cards article). ACTV city bus ticket to the airport. (See our Venice Aiport Buses article, which suggests a better option). For more information on travel by ACTV public water bus, see our articles on Venice Vaporetto Routes and Venice Vaporetto Fares. Once you've decided what kind of ACTV ticket to buy, touch the interactive screen to begin your purchase. Note: The image on the screen may be different from the one shown above, depending on what ACTV wants to publicize or promote at any given time. 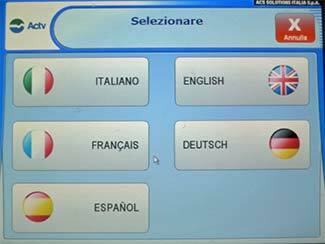 Touch the next screen to choose a language: Italian, French, Spanish, English, or German. 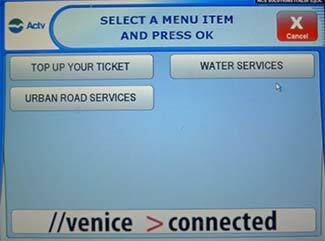 Using the touch screen, choose "Water services" if you're buying a ticket for a vaporetto or motoscafo water bus. 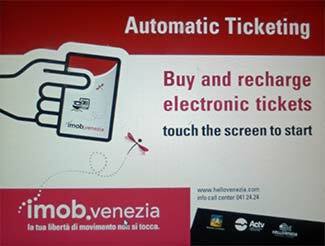 Tap the menu item for the type of ticket you want to buy (either a Tourist Travel Card or a single vaporetto ticket that's valid for 60 minutes in one direction). Tip: The Tourist Travel Cards can be a good value if you're planning excursions, but within the city center, it's often faster to walk than to take a vaporetto. After you've chosen your ticket type, a screen will show how much you owe. If you're paying by banknote, pay attention to the "Max. Change" amount, or you may find yourself paying a huge sum for an already expensive ticket. If you change your mind about buying a ticket, or if you want to start again, click the "X" in the red box. 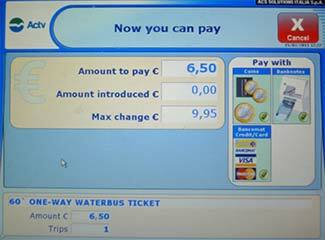 Use a credit card, debit card, euro coins, or euro banknotes to pay for your ticket. Once you've paid, the machine will print your ticket and deliver it (with a receipt and and any change that's due) in the slot below the touch screen and payment panel. 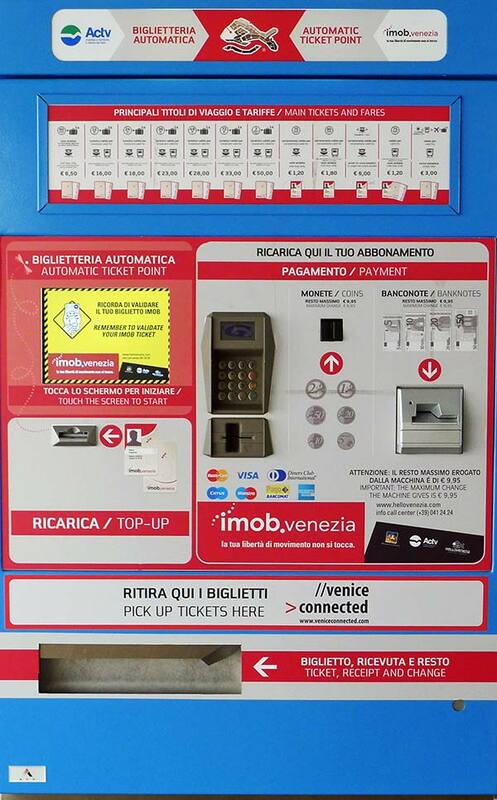 Note: If you've bought a carnet and the machine dispenses only one ticket such as the one shown here, don't worry: Your "biglietto ricaricabile" (rechargeable ticket) is a stored-value card that holds multiple fares.